MARIA ANDREA JANE ASKED ME TO! hahah!!! wanna know what i'm talking about here??? oooh! yeah! there's a hate zone! i thought there wasnt one but.... oh well! now who's gonna start bashin? Gawd. 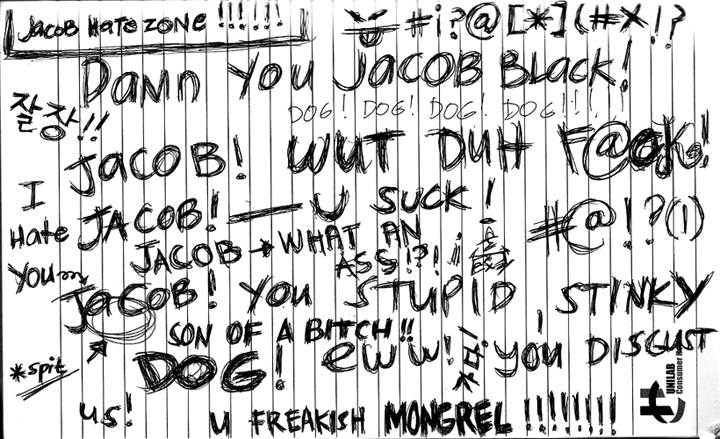 Jacob is such a **#@!&*^$!!! and bella was all like, "Kiss me Jacob!" argh! can't he see that she belongs witn Edward? and he's soo forcing himself to her!! Everything WAS perfect when JACOB didn't interupt the story!!!! I was kinda okay with me in twilight, jacob being 15 and having this secret crush on Bella. It WAS A-okay! but THIS?? GOD, man! THIS IS WRONG! same here! I thought he's just an EXTRA! ahha... so in the first book i didn't mind him that much! i know! haha... maybe meyer wants some rivalry going on... but hello? 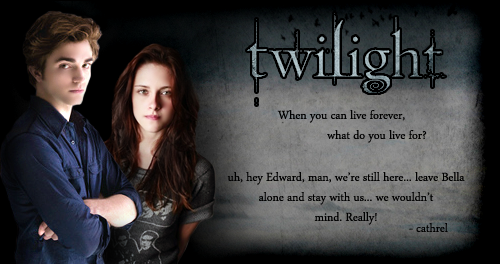 her story's perfect with JUST edward himself!!! and LOL at your keyboard. anyway, i've realized that i don't hate jacob THAT much now. but STILL, I HATE HIM! that's exactly what me and joanna talked about just today! HOPING THAT JAKEY WOULD FIND HIS IMPRINT! well, i'm kinda relieved by the fact that she isn't Bella. at nang:what if he'll imprint on sam's ex?or humans?angela? vampy_princess505 wrote: at nang:what if he'll imprint on sam's ex?or humans?angela? LOL, i hope its angela. I want mike newton to my own. LOL.